The dead have risen and now roam freely on the surface, and just like last time this happened, society collapsed. Completely. Or did it? Wait, no, because… for some reason, there’s this idiot running around, determined to deliver mail. In spite of everything that’s happened/happening. Zombies? Not a problem – dude’s packing a shotgun with unlimited ammo! Everyone’s dead? Who cares! There’s mailboxes to fill, and not Snow Nor Rain Nor Living Dead shall prevent this guy from doing his job. Although if society has fallen, where are all these letters, packages, etc. going? Ah, of course: safehouses. Locations in which I suspect civilians have taken shelter, finding safety – however temporary – from the walking living dead. Yeah, let’s go with that. As for exactly what the protagonist is working so hard to deliver, blasting zombies in the face as he go along racing against the clock – I haven’t the foggiest! Oh right, almost forgot to mention that you’re actually on a time limit in each level (however generous, during my time spent playing). Dally too much in a level and it’s game over, courtesy of a ‘cleansing’ nuclear bomb dropped by, well, the military, one would assume. But with unlimited bullets and three hearts/lives, it’s mostly a matter of keeping on the move, shooting in a direction the second you notice something coming towards you. That and… deliver mail by flinging it into designated mailboxes. Easy enough. 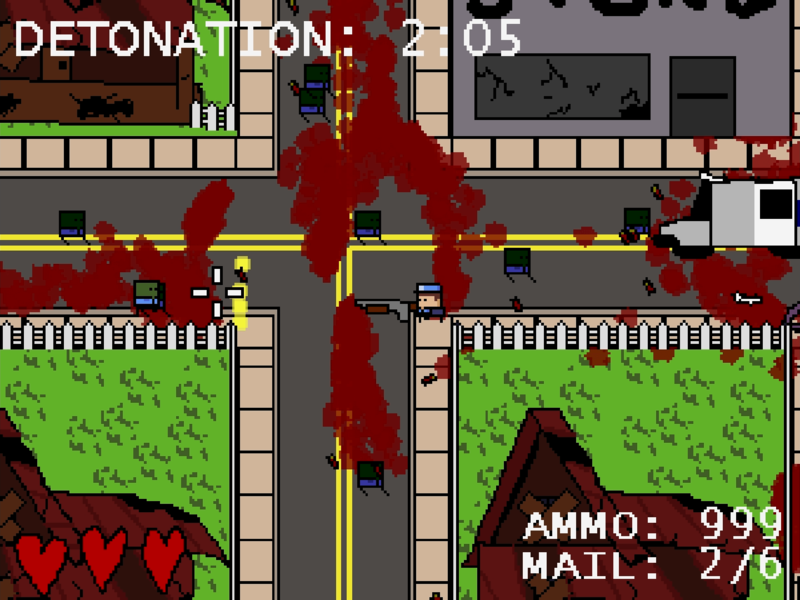 That said, Snow Nor Rain Nor Living Dead was quite enjoyable, blood flowing in the streets as zombies were mowed down in an attempt to fill the quota and move on to the next level before bombs started falling, randomly generated levels/mail requirements and all. Rough around the edges, sure, but still very much worth a few minutes of your time. Snow Nor Rain Nor Living Dead is available from itch.io, for free.